Here’s a brief introduction about what “Ciclofficina RuotaLibera” is, and what we do (or just check our MANIFESTO out, english version is below). The Ciclofficina is a bycicle no-profit workshop, runned by students, and located in the courtyard of the Faculty of Agriculture of the University of Milan. It has been founded by the student collective “Sveglia CittàStudi” in 2003, in order to promote an urban use of bycicle, in the most easiest and direct way: by teaching how to DIY repair, and take care of your bike. It’s a straightforward political choice, plus we do not aim to substitue professional bike workshops; you don’t need to pay for our work as mechanics, but only for the spare parts you use. The new ones, at the price we bought ‘em, while used ones it’s up to you. In fact YOU work on your bike, assisted by someone who can show you how to do a proper repair (hopefully! 🙂 ), so the next time it happens, YOU will already know how to fix the problem on your own, and maybe spread YOUR knowledge also to someone else! P.s. If you are wondering what the hell “Ciclofficina Routalibera” means anyway, it could be translated into ” FreeWheel Ciclo-workshop”, or something. As you enter the Faculty of Agriculture (Celoria st. n°2), turn right and pass the wicket, you’ll find yourself in the backyard, turn left and head towards the greenhouse, in front of which you’ll find the “Ciclofficina”. We are open every friday afternoon, approx. from 3,00 pm to 7,30 pm. If you are an Erasmus student, no matter which university your attending at (i.e. Università degli studi di Milano, Milano Bicocca, Politecnico di MIlano..), or for how long, according to our possibilities, we offer you a bike rental service for the time of your stay in Milan. Our only condition is that you leave us a deposit of 40 euros when you retire the bike, which we’ll give you back when you’ll return it to us (obviously, the bike hasn’t to be broken or such..). Also, please rember that we are a VERY small workshop, with FEW bikes to rent, so even tough we try to do our best, there are quite good possibilities that you unfortunately will found no bikes avaible for renting! But don’t despair! 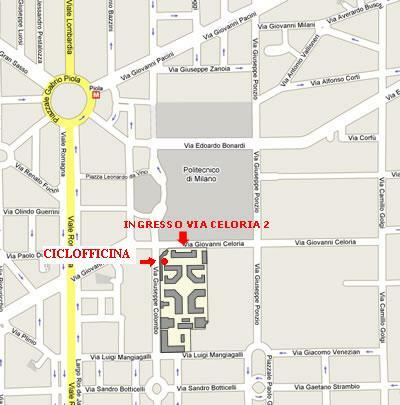 Milan has also other nice “Ciclofficine-bike workshops” where you can ask, see the links in the main page. And, of course, enjoy your stay !!! I was hoping you would have information on where I could purchase a good used touring bike? I am flying into Milan on April 29th and from there I’ll be biking up to Switzerland. I don’t have a bike yet unfortunately. I’ve been checking Subito.it for possible bikes but I thought you would know of a shop that could help me out. Your feedback is appreciated.